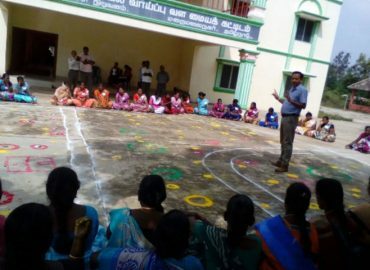 A 3-day’s Refresher Training was facilitated by FF on Community Approaches to Sanitation (CAS) at Chennai, Tamil Nadu from 1 – 3 Nov, 2017. This workshop was organized by Zilla Panchayat, Thiruvallur with technical support of UNICEF. This workshop aimed at creating a critical and sensitive resource pool through building their capacity on CAS. A total of 80 participants from all the blocks of Thiruvallur District were part of this workshop.